Boost energy and ease chronic fatigue and exhaustion with the accessible exercises in these classes! Chronic pain and illness, stress and overwhelm, or the fast pace of life...it all can leave you feeling sluggish and tired. If you struggle with low energy or find you have big energy swings throughout the day, the simple exercises in these classes can help. 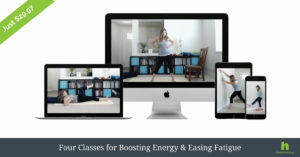 Classes in the bundle are valued at over $79, but for the next three days only you can save over 85% and get lifetime access to this bundle for just $9 (less than the cost of a single drop-in yoga class)!